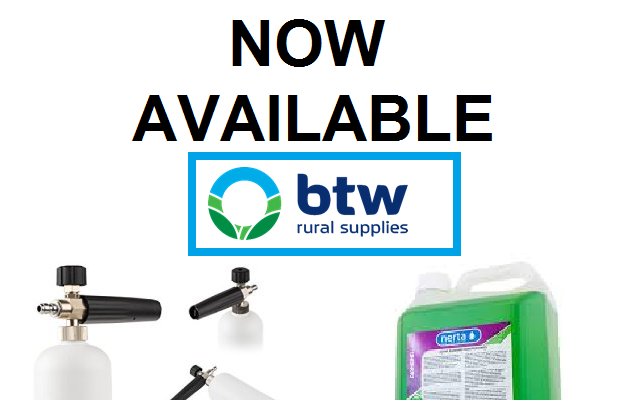 NOW AVAILABLE AT BTW RURAL SUPPLIES. Nerta is a leading manufacturer of cleaning and caring chemicals in the car and truck wash sectors, professional cleaning, food industry and agriculture. Nerta manufactures innovative and high quality products for the cleaning and maintaining of your fleet. Try Nerta Now For A Brushless & Scrubless Washing Experience. Are You Ready For FIRE SEASON ? 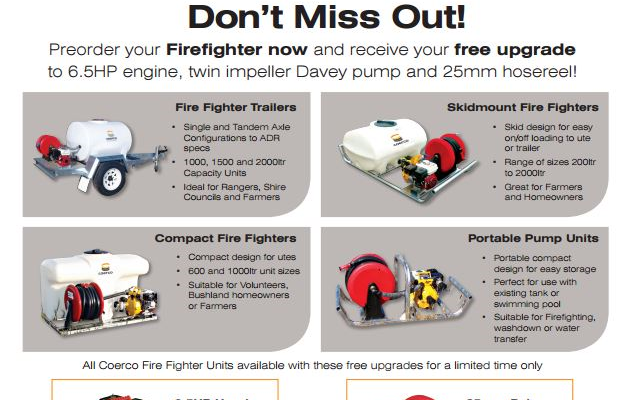 13 Bushfire Tips’s with Fire Fighting Equipment ! Every year, devastating bushfires cause loss of life and millions in property damage in Australia. Protect your house and your family by preparing for bushfire season. A well prepared home is more likely to survive, whether you plan on staying in your home for the fire or evacuating. If you live in a bushfire prominent area, it’s your responsibility to take the necessary steps well in advance to prevent harm to your neighbors, family, and property. 1. Clean your gutters of leaves and any twigs. 2. Mow your lawn regularly. 3. Install metal mesh screens on doors and windows. 4. Attach a fire sprinkler system to gutters. 5. Repair damaged tiles on roof. 6. Cut back trees or shrubbery. 7. Move any flammable items such as wood, paper, boxes, crates and furniture far away from the house. 8. Make sure your hose is easily accessible from anywhere around your house. 9. Enclose open decks around decks and verandas. 10. Check and maintain insurance checks and make sure it’s up to date. 11. Check that generators and water systems are working. 12. If you have a pool, put a Static Water Supply sign by your front door so firefighters know where they can easily get water if needed for their fire fighting equipment. 13. Make sure your First Aid Kit is fully stocked. Government of Western Australia – Refer to this website for the “5 Minute Fire Chat”, as the single biggest bushfire killer is indecisiveness. Other helpful tips to manage your time before or during a bushfire. NSW Government – More tips on how to prepare your home efficiently. This website also includes an informative, quick, 1 minute video on bushfire facts. Queensland Government – Visit this website for tips on preparing your home before, during, and after a bushfire. After care bushfire cleanup tips are listed, plus information on asbestos safety. South Australian Government – Review the current bushfire conditions in your area. Victorian Government – Check the safety of your home and the current road closures, safety conditions and local warnings. Northern Territory Government – Visit to get a permit to burn in rural areas. Tasmanian Government – Learn about the fuel reduction program, get their bushfire survival plan and read more about fire safety. We want you staying safe during bushfire season! For more information regarding our top of the line firefighting equipment, contact BTW Spray Shop today.